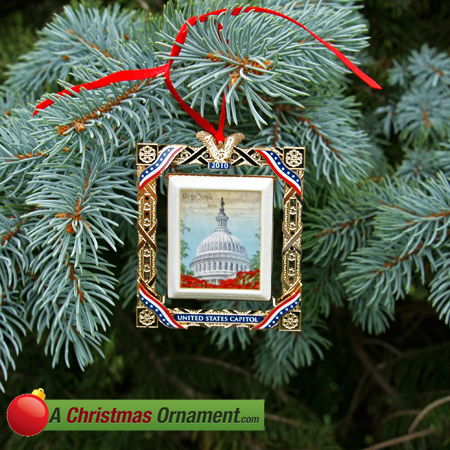 Christmas Ornaments Made in USA - 2010 US Capitol Marble Framed Dome Ornament - A Christmas Ornament Co.
2010 annual marble collector’s ornament features the dome of the Capitol accented by summer flowers adding warmth to a holiday classic. Made with marble from the original 1863-1865 Capitol steps that were removed and replaced in the 1995 restoration of the steps. A 2” x 2.75” patriotic 24 KT. metal frame surrounds the marble inset. Elegantly gift boxed with provenance card.